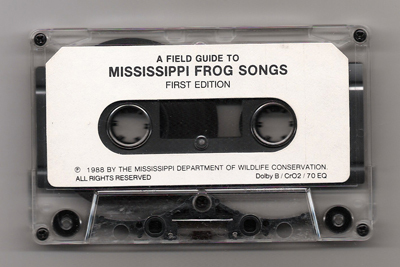 Mississippi Frog Songs is an out-of-print cassette tape and accompanying booklet released in 1988 by the Mississippi Department of Wildlife, Fisheries and Parks, or, if one is to believe the label on the cassette instead of that of the booklet and tape case, the Mississippi Department of Wildlife Conservation. The tape records the calls of some Mississippi frogs and toads. It is entertaining to imagine the lengths to which a researcher might have had to go to get such recordings. Sitting still for long periods of time at night in the backwoods of Mississippi is not necessarily a comfortable pastime. Mississippi Frog Songs is a 30-minute cassette album of the calls from 28 species and subspecies of frogs and toads resident to Mississippi. Publication of Mississippi Frog Songs is for educational purposes only. Calls from 28 frogs and toads. Recordings (except as noted) were made and produced by W. H. Turcotte. Narration by Milt Lawrence. Families arranged alphabetically. Species arranged alphabetically within families. In an attempt to rescue these data from inevitable obscurity I have reproduced them in their entirety here, operating on the assumption that it is easier to ask for forgiveness than to ask for permission. Perhaps the Mississippi Department of Wildlife, Fisheries and Parks will even appreciate the effort to preserve the information. Update, Nov. 2010: I have recently been informed that these recordings are offered on CD by the Mississippi Museum of Natural Science's gift shop. All pages of this site, with the exception of this one, reproduce the contents of the tape and booklet as faithfully as possible. The text is presented as it appears in the booklet, and the audio is segmented into 28 individual clips. The sound clips are MP3 audio files, each between approximately 1MB and 2MB. A list of direct links to all the MP3 audio files and a page displaying scanned images of the original materials are also available. I am not a natural scientist of any kind. I don't know anything about the material other than what is presented here. I hope that by republishing this information I am helping to create an archive that will last longer than a cassette tape and that will be more readily discoverable for future researchers. And I suppose it is not impossible that some day such records for some amphibious species may be all that is left of them. I must confess that much of my reason for taking the trouble to republish this information has also to do with its entertainment value (and don't miss the opportunity to play the sounds for any housecats). Particularly amusing are the songs of the Eastern spadefoot, Crawfish frog, the Dusky crawfish frog, the Bullfrog, the Pig frog and the River frog. Sometimes background noises (including people's voices) are as fascinating as the sounds of the frogs. One can faintly hear someone talking in the distance at the ends of several recordings. And I would be remiss if I failed to mention that the narrator's voice is simultaneously soothing and hilarious to me. I am in no way associated with the Mississippi Department of Wildlife, Fisheries and Parks and I am not making any profit from this website. As I am the sole manager of this website, please if you have questions about the site, rather than the Mississippi Department of Wildlife, Fisheries and Parks. There should be an audio controller displayed with each frog song, something like this: It may take a few moments for the controller to load in a browser, as the sound files are between 1 and 2MB. Internet Explorer users may get the annoying "Press SPACEBAR or ENTER to activate and use this control" message. Try Firefox if you want a browser that doesn't make you do that. Tools I used to create this website: Macintosh PowerBook G4, an old JVC tape deck (patched into the microphone jack of the G4), Amadeus sound editing software, an HP Officejet 5510 scanner, and Readiris text-recognition software. HTML pages were edited with TextWrangler. Originally published in 1988 by Mississippi Department of Wildlife, Fisheries and Parks, Jackson Mississippi.